BBC NEWS | Business | How high can business class airlines fly? The budget market is well-known as the cut-throat sector of the airline industry, but a new scrap is about to take place at the other end of the flight spectrum - in business class. BA and Virgin Atlantic are about to have their status as the UK's main carriers of transatlantic premium traffic challenged when two airlines launch their business-only class flights, with the first taking to the skies on Tuesday. Eos and Maxjet will both fly between New York's JFK and Stansted, which at present does not offer any scheduled flights to the Big Apple. They hope to be able to take away customers from BA, Virgin, and the big US carriers by offering a luxury service to all their customers. 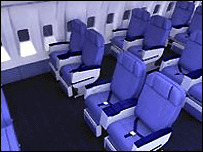 Eos has 48 seats that recline into flat beds on a Boeing 757, which normally carries 180, while Maxjet has 102 seats, all with double normal legroom, available on its Boeing 767. However, while the pair may initially seem to be offering a similar type of service, the Eos experience is more like flying with a corporate or private jet, while Maxjet says it is the first "low-cost business airline". But analysts fear that a number of pitfalls could await the newcomers; the attractiveness of Stansted to business travellers, having only one flight a day each way initially, and a lack of corporate incentives such as points or air miles. "It is interesting that people are trying to change the conventional methods," says Chris Avery, an airline analyst at JP Morgan. "But I don't see them challenging the large volume carriers of business class and premium traffic. "There is a risk in operating from Stansted. Premium traffic has to get over a cultural problem of setting off from Stansted." And Tim Coombs, managing director at consultancy Aviation Economics, says despite good contacts with the City of London, "Stansted is not a favourite of business travellers". Mr Coombs believes that only having one flight each day may make the Eos and Maxjet propositions unattractive to business travellers who find themselves running late for a flight, or have to change plans at short notice. And, although both airlines aim to launch a second daily service early in 2006, doubling their overall capacity to 300 seats, Mr Coombs says it may be a problem initially only having one aircraft. "You only need to have slight technical problems to be in difficulties, or to have effects to your reputation," he says. However the men at the helms of the two airlines are confident their services will be successful. 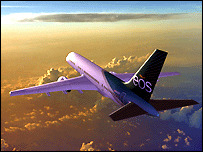 The founder and chief executive of Eos is Dave Spurlock, an American who was formerly director of strategy at British Airways. He has raised $87m (£49m) from investors, including Sutter Hill Ventures of Silicon Valley, Golden Gate Capital of San Francisco, and Maveron, the venture fund founded by Starbucks chairman Howard Schultz. Its flights start on 18 October. Mr Spurlock believes Eos can provide a new service for the "discerning business traveller". "Eos enables business travellers to make the best use of their flying time - to prepare for a meeting, work on a presentation, or simply relax and revive for what awaits them at their destination," Mr Spurlock says. And Eos point out that Stansted is the "fastest-growing major airport in Europe", situated "within easy reach of London's Canary Wharf business district". However Mr Coombs says that it may be hard for the pair to compete against bigger carriers who can offer points, air miles, and other "powerful marketing tools". Chris Avery at JP Morgan agrees, saying: "The challenge will be to get the big corporate customers giving them their business, but it might be difficult in reality." Eos also says it has a spare aircraft positioned at Stansted so there will always be reliability. On the other possible criticism, it says there are financial arrangements for corporates and plans "to have a loyalty programme rewarding customers with product, instead of miles". Maxjet's chief executive is Gary Rogliano, it has received $40m from ten wealthy Americans, including Ken Woolley who helped launch JetBlue, the US budget airline. It will start flights on 2 November. Mr Rogliano says Maxjet offers a "high-quality, low-fare business class product". "Maxjet was designed to appeal to the savvy traveller with luxury amenities for all passengers and the highest standards for comfort, value and service." 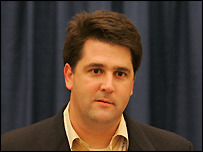 But Tim Coombs believes both carriers may end up looking for entirely different customers than first envisaged. "Both airlines may take passengers from the upper end of the leisure market, rather than necessarily the business class traffic away from large carriers," he says.